Ever since coming home, I have focused more and more on gluten-free cooking. I have made a gluten-free pizza crust which was surprisingly good, some gluten free Indian foods, and other cool stuff. But for Father’s Day, I wanted something that my mother could eat too for dessert…so I though, maybe my chocolate-sprinkle rice krispies treats? No…Maybe some french macroons? Naw, too time intensive, and she’d want me to hang with the family…ah ha! 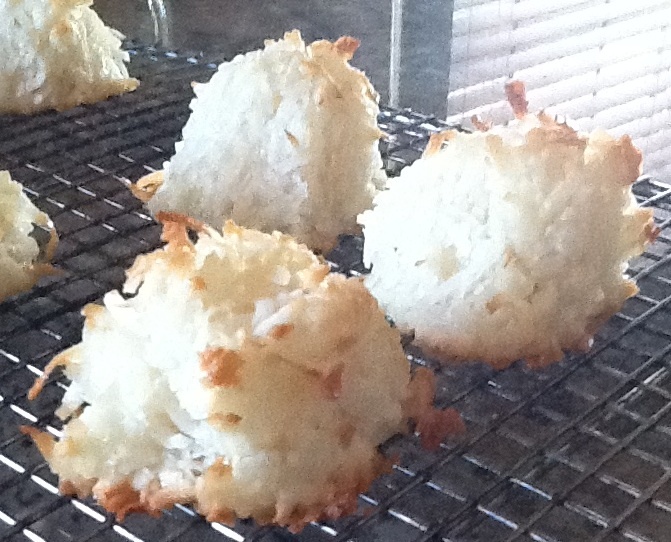 Coconut Macroons…light, beautiful, and not too much sugar. Epic. 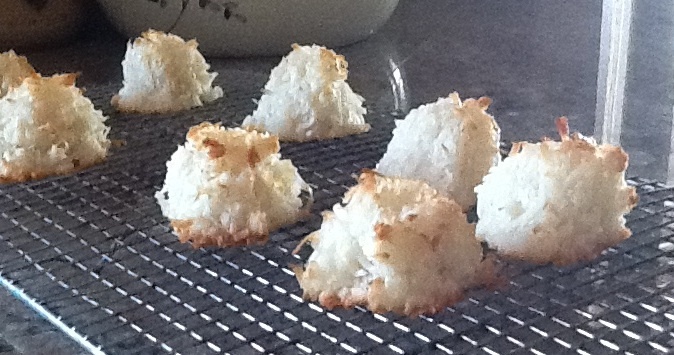 They’re really not time intensive…so mixing, so cooling, some baking, and you’re done. You can jazz them up any way you want, you can pipe some ganache on them after they’re cooled, you can dip the bottoms in chocolate like my inspiration did on 17andbaking, or you can dip the tops in chocolate and call it an opposite mountain. I opted against that…preferring a plain, simple, presentation. No chocolate, no fuss, no nothing. Also, I was lazy. 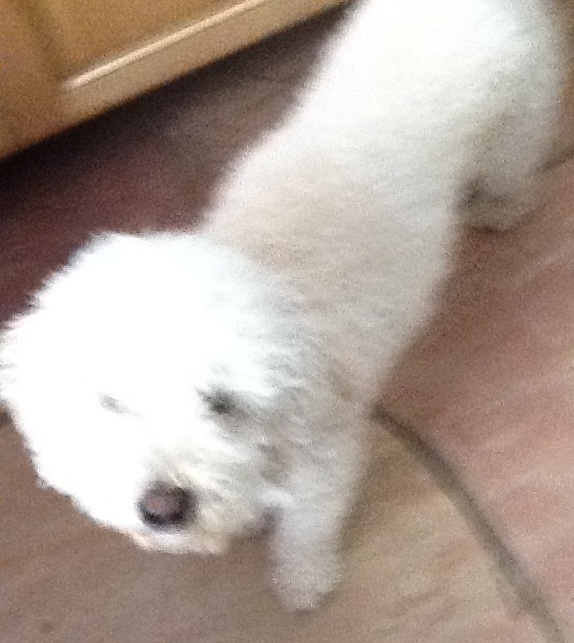 Oh yeah, this is a picture of my dog. Doesn’t he look like a Macroon? So a Happy Father’s Day to y’all, I hope your fathers all had a lovely day! 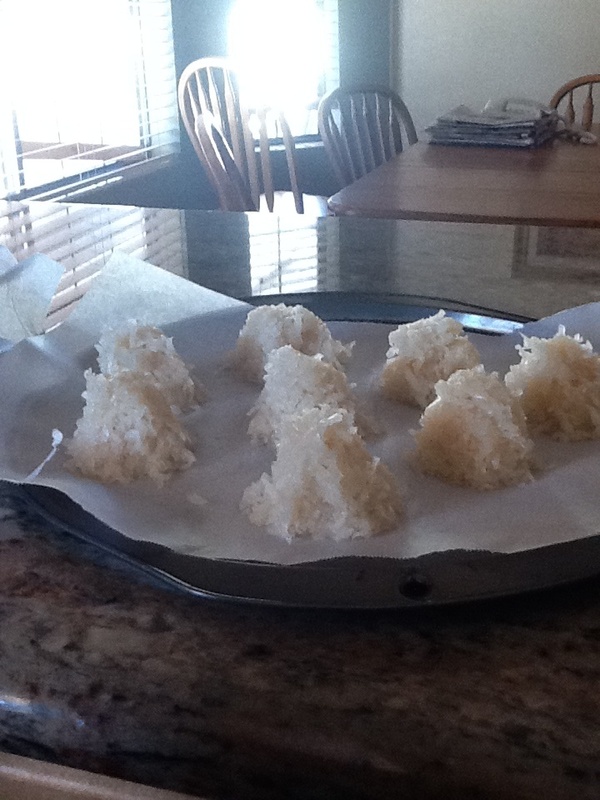 In a medium saucepan mix together the egg whites, the coconut, the sugar. Mix over medium-heat for about 7 minutes, until the mixture goes from liquid-y to kind of pasty but not dry. Take it off the heat and mix into extracts. After that, spread it out on the mixture on a sheet pan, and refrigerate for 30 minutes. Pull it out, and either scoop it into the a mini-ice cream scooper or spoon it into a 1/4 cup measuring cup for a dome shape. 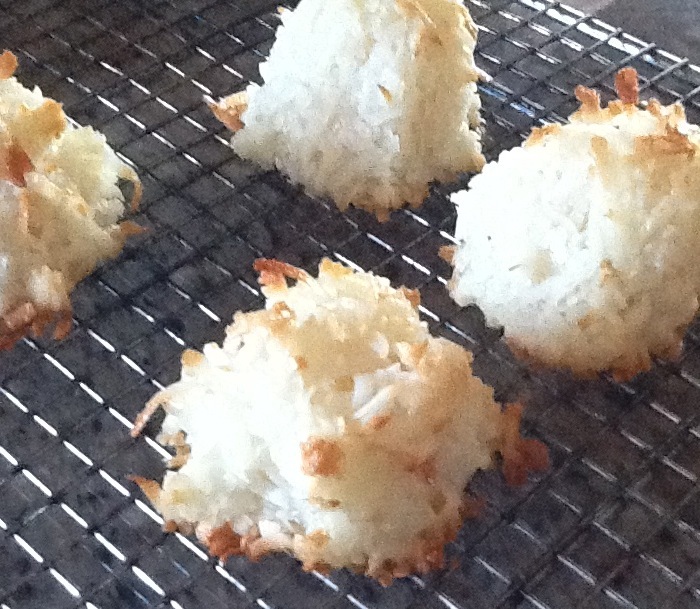 Place each coconut dome on a parchment paper lined sheet pan. Put them in the oven and bake for 25 min, or until brown on top. Pull them out, and let them cool on a wire rack. After that, you dip them in melted chocolate(6oz. chocolate with 1/2 cup heavy cream over a double boiler), and let them cool in the fridge on parchment paper, or you can serve just as they are…or on top of a tasty scoop of ice cream! Store in an air-tight container in the fridge. WHOA those look amazing. I seriously need to get on my baking!